(16/P70) TRENTON – One hundred years ago this month, German saboteurs set fire to a munitions depot at what today is now part of Liberty State Park, triggering a massive explosion and fires that left seven dead, shook the surrounding region with the force of an earthquake, was heard as far away as Philadelphia, and damaged the Statue of Liberty. The explosion rocked the nation at a time when World War I was raging in Europe and President Woodrow Wilson was trying to keep America directly out of the conflict while provisioning the Allies with much-needed munitions and other supplies. On Saturday, July 30, Liberty State Park will commemorate the 100th anniversary of what has gone down in history as the Black Tom Island explosion, and will honor the victims of this act, part of a series of German espionage and sabotage which some historians have called the first acts of foreign-based terrorism in the United States. The ceremony will take place at 10 a.m. at the U.S. Flag Plaza, 200 Morris Pesin Drive in Liberty State Park, Jersey City. The event is free. Speakers will include Ron Semple, Jersey City native and author of Black Tom: Terror on the Hudson, as well as National Park Service Ranger Lee Fahley. New interpretive signs to be installed near the site of the disaster also be unveiled. A student documentary and additional interpretive material will also be on exhibit at the newly re-opened Central Railroad of New Jersey Terminal throughout the day. Prior to becoming Liberty State Park, the Jersey City waterfront served as a vital transportation hub during the Industrial Revolution of the 19th and early 20th centuries. The area that was known as Black Tom Island is now occupied by the park office and adjacent parking lots. But a century ago it was home to an enormous munitions depot stretching along a mile-long pier connected to the Jersey waterfront by landfill. The area was occupied by a complex of warehouses, railroad sidings and barges brimming with millions of tons of explosives, ammunition and fuel destined for the Allies fighting Germany. At 2:08 a.m. on Sunday, July 30, 1916, German saboteurs, seeking to disrupt the flow of ammunition to the Allied war effort and as retribution for a British blockade of their homeland, set fire to the munitions depot that triggered a catastrophic explosion, followed by a series of smaller explosions that lasted for hours. 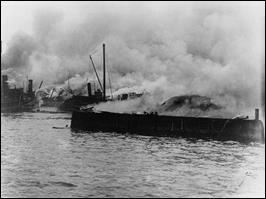 Flying bullets hampered firefighting efforts as munition shells rocketed across New York Harbor. Property damage was estimated at $20 million – more than $500 million in today’s dollars. The Jersey City and Lehigh Valley Railroad police forces sustained casualties. The pier stood opposite the Statue of Liberty, which sustained damage to her robe and resulted in the permanent closure of her torch to the public. The attack was part of an ongoing series of German sabotage of munitions-related facilities in the United States, including a fire and massive explosion set at the Roebling Steel foundry in Trenton, which made munitions destined to assist the British and French. This attack occurred just three months before America officially entered the war. Liberty State Park is dedicated to the preservation and interpretation of its rich history and natural resources. Its waterfront location provides a green oasis along nearly five miles of Hudson River shoreline. With the Manhattan skyline, the Statue of Liberty and Ellis Island as a spectacular backdrop, Liberty State Park is one of the state's most dramatic and popular parks.